A very popular hedging rose, the Apple or Ramanas Rose (Rosa rugosa) is a quick-growing, hedging species, putting on between 30cm (1ft) and 60cm (2ft) of height growth each year. A non-evergreen rose and distinguished by its prominent, appealing large, reddish-orange hips which form in summer and last well into winter. 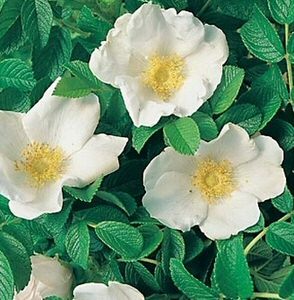 Delicate single white coloured flowers, which are in marked contrast to the pink flowered Apple Rose, are very fragrant , keep forming throughout summer. An attractive idea is to plant both the white and pink flowered Apple Rose varieties as they compliment each other. The branches of an Apple Rose are covered in masses of small prickly thorns, hence its attraction in forming an impenetrable barrier.